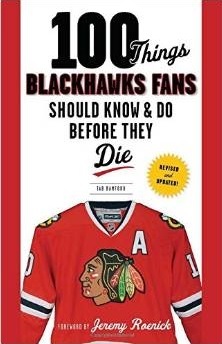 Last week, in honor of our passing 4,000 likes on our Facebook page, we gave away a copy of Stan Mikita’s book. 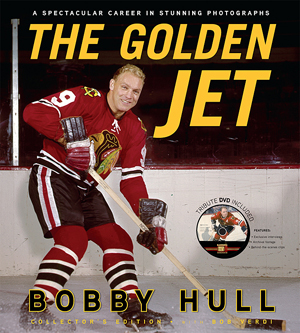 Now, we’re going to give away a copy of Bobby Hull’s book, The Golden Jet. Last week’s trivia question surrounded the first NHL goal from the Blackhawks’ current captain, Jonathan Toews. This week’s question has to do with Patrick Kane’s first goal. Submit your answers to the trivia question (below) through the Contact Page. The first 10 correct answers will be put in a hat, and a winner will be drawn from there. We’ll contact the winner via email. Twelve days after Toews’ first goal, a young forward named Patrick Kane scored his first NHL regular season goal as part of a three-point night. But he wasn’t the only Hawks’ player to have a three-point night that evening. What other player had a three-point game the night Kaner scored his first NHL goal? We’ll update this post when the contest is closed, and post the winner’s name once we verify the details.